OK I'm aware that Cat Blogging is quite popular, but what about the dogs? 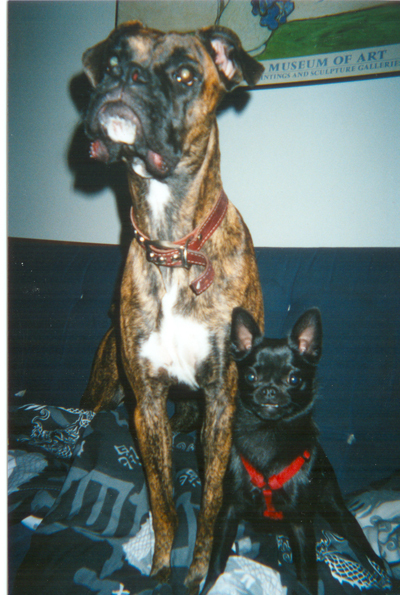 To kick off the new craze in Dog blogging, I offer a picture of my daughter Nichole's dog Sugar, a purebred brindle Boxer, and daughter Ann's dog Bela a Pomeranian/Pug mix who condesended to pose together for grandpa. Singing "Ya-ho Blue, you good dog you"
I said "Ya-ho Blue, you good dog you"
And get me a possum in the new-grown corn.